Izri ibn Ali stepped out his tent just before the sun was to rise, while the frost of the night still lingered over the desert. He enjoyed the quiet time, before the rest of his people woke up, to have his first tea in solitude. Before he has even taken the five steps to the dying fire of the night, a man he had never seen ran by, stepping on his foot. When he turned his head to see where the strange man was going, but instead found himself staring into the face of a camel that bad-naturedly – and halitotically – roared at him. Looking up, he not only saw the camel’s rider, another Tuareg, but also that he was only the head of a caravan that stretched almost to the horizon. Izri ibn Ali missed the days when the great Sahara desert was a wide and empty space and there were no lines at the silversmith. The realization that shocked Izri ibn Ali was the first thing I learned from playing Targi. The desert may look wide and vast, but that’s an illusion, a fata morgana. It’s really a very small area. Phenomenal sandy landscape, itty-bitty living space, that sort of thing. To begin with, the Sahara desert doesn’t even seem so small, its border consist of no less than sixteen cards which are fixed, creating an interior of nine cards, ever-changing like the desert itself. But once all the main actors show up, things get crowded. First, there is the raider. He starts out on the first border card – The Noble – and walks around the board. Whenever he reaches a corner he raids your tribes’ camps and steals resources or victory points, then immediately goes on to the next card. He only walks around the board once, then he ends the game. But one robber does not fill up the desert. To do that, you need the two players’ tuarple. 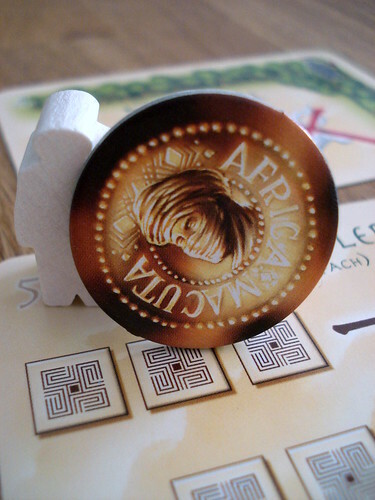 That’s Tuareg meeple. 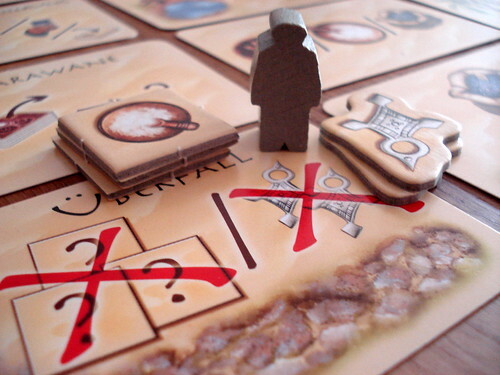 I apologize that it’s not a particularly nice-sounding word, but if I pass this opportunity to finally use a meeple neologism again, my editor is going to come down on me like a ton of sand. So tuarple it is. The tuarple tribes have very strict traditions where they can and cannot stand, restricting the available space further still. To start with, no tuarple can stand next to the raider. That’s just sensible, you don’t go and sit on a park bench next to the city’s best known pick-pocket, either. They also can not stand on the same card as another tuarple – they grew up in the vastness of the Sahara, two is definitely a crowd to them. They can not stand opposite an enemy tuarple – the tuarple are great marksmen, you don’t want to stand in a straight line from someone who has a grudge against you. Finally, no tuarple can stand in the corners – those are the raiders hideouts, and he hates visitors. With all these restrictions, the Sahara becomes a very small place indeed, the last tuarple doesn’t have many options left where to stand. To give both players the joy of increased choice sometimes, the starting player token changes hands every round. Now that we figured out how tuarple can stand around the desert, you must all be wondering about the why. For regular readers, or anyone with only a little experience with boardgames the why can be summed up in two words: worker placement. Once both players placed their three tuarple, they may take the actions on their chosen cards in any order. About half of those cards simply give you trade goods: salt, pepper or dates. The rest does more interesting but not always more useful things. For example, the Trader lets you to trade two resources of the same kind against one of another, or three resources against a rare and valuable gold coin. The Silversmith turns goods or gold coins into even more valuable victory points. So far, everything happened at the border of the desert. What about the interior? There has to be something interesting there. There is, but no tuarple would venture there himself. Instead, they just control parts of the desert from the border: when you have tuarple controlling a row and a column of the desert, then you place a control marker where those two intersect. In most rounds, this means you will have two control markers from your three tuarple – sometimes you may end up with only one, if two of your workers end up facing each other. The control markers give you additional actions from the cards they are placed on. About half of these are goods cards. They let you take goods just like the border cards, but may have a better payout. Some even give you a gold coin or a victory point directly, without the need to visit the Trader or the Silversmith. The other cards are tribe extension cards: they go to your personal display which can hold up to twelve cards in three rows. Tribe extensions are not really explained thematically – from the name and what most of them display – tents, watering holes, camels and oases – it should be something you acquire for your tribe, to make them more prosperous. If that’s the intention, then it’s a bit unfortunate that the fifth type of tribe extension card is “women”. Gender insensitivity aside, all tribe extension cards have a price in goods and gold and are worth victory points. Many also have an added benefit: they might make further cards of a specific type cheaper, give you additional ways to score points at the end or otherwise bend the rules in your favour. If you cannot pay for a tribe extension card, you may just leave it where it is or you may take one such card to your hand. Cards in your hand can later be bought – or discarded, if it turned out to be not so useful after all – using the Nobleman border card. Unlike the stable border of the desert, the interior never stays the same: once you used a card here, it’s replaced by one of the opposite type. The game continues until either the raider completed his round around the desert or until one player has 12 cards in his personal display. Points are summed then, from victory point tokens acquired during the game and from tribe extension cards and their special abilities. Additionally, you can win extra points by having four cards of the same type or four cards of all different types in a row of your display. Targi is not an incredibly complex game – all the rules easily fit on six small pages with illustrations and examples – but there is some depth to it. Choosing actions is not hard by itself, you can easily come up with a combination of actions that will let you get the card you want. Choosing actions that your opponent will actually let you have, however, is much harder. It’s usually pretty obvious which cards are good for you, making it easy for the other player to block you. The Fata Morgana card that lets you move one of your action markers to another card only offers limited protection against this, not least of all because it’s easily blocked itself. But blocking your opponent and avoiding being blocked yourself is only the first layer of strategy. After two or three games, you’ll find that replacing used interior cards with cards of the opposite type can really work in your favour: say you’re the first player now and you want to be able to buy a tribe extension next round. It’s a really good idea to use goods cards in good positions this round, even if you have to discard the goods you gain because of the resource limit, because this makes sure that tribe extension cards show up in those spots, and you can arrange for tribe extensions to show up in a way that your opponent can not block you from all of them. On top of that, you’re still considering your own display, how to get the bonuses for the rows and how to use the special abilities you already have to greatest effect. This is not a game where you plan ten turns ahead – the ever-changing interior of the desert prevents that, anyway – but your tactical decisions are not easy. It’s an interesting, thematic two-player strategy game that ended up being the light-weight contender in this year’s Kennerspiel des Jahres instead of the heavy-weight in the traditional Spiel des Jahres. It could have gone either way for Targi, but it does deserve to be in the running. If there is something that could be improved in Targi, then it’s the narrative arc – your options at the end of the game are pretty much the same as they are in the beginning, only improved by some of the tribe extension cards. But that’s a minor point, I never felt bored playing Targi so I can’t really say it has arc problems. It just could have a bit more of it. 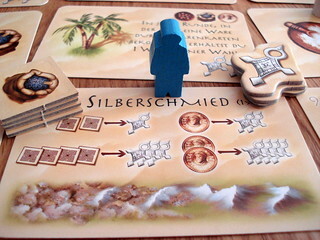 There could have been a few more components in the game, especially the victory point markers run out very early if both players make heavy use of the Silversmith, but the trade goods can also be problematic. But although some components are simply too limited in number, Targi is also a good-looking game. The illustrations by Franz and Imelda Vohwinkel are few – there’s just not many different elements in the game – but fitting and especially the cover art of a tuareg’s eyes is great. Minor complaints about the number of components and the arc aside, I thoroughly enjoy Targi. It’s a game that is tactically challenging but does not require the same amount of focus most abstract two player games do – plus the fact that it is actually a thematic game, not an abstract, allows me to play it with certain people suffering from a severe abstract allergy. The competition is tough for Kennerspiel des Jahres this year, but Targi certainly has a chance to win the award.